Thank you to Doodle Pants for providing me with product, free of charge, in exchange for my honest review. All thoughts and opinions shared are my own. The weather can be so funny this time of year. It's June, and one week, we're in short and tees, and then the next, we're back in long pants and cardigan sweaters. To keep anyone from getting sick, we tend to dress in layers. We live in the Carolinas, and this time of year, highs for the day can be anywhere from the 70's to the 90's! Baby S is two months old, and we do everything possible to make sure she's kept safe and warm. Baby leggings are perfect to slip on and off when the temps are cooler! Sure, we could dress S in plain old baby leggings, but why would we want to when Doodle Pants are available? 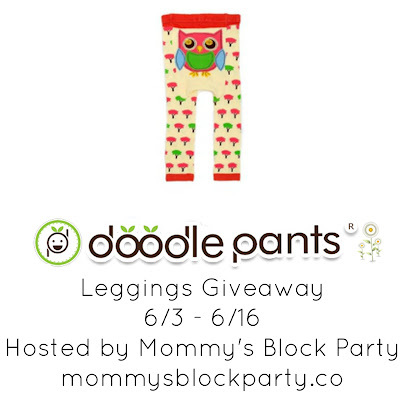 Doddle Pants are adorable leggings for babies and toddlers in a variety of different designs. Lots of celebrity babies have been spotted in their Doodle Pants. The brains behind the Doodle Pants name wanted to design clothes that would make your life easier, too: Leggings cut to fit over cloth diapers, shirts minus that scratchy tag babies hate, super cozy hooded bath towels, and bodysuits with easy on/off snaps. ‘Cause here’s the thing: Soon enough they won’t let you dress them, but right now you have all the power. Why not amuse yourself a little? Check out the adorable Doodle Pants we received! We were sent a pair of the Pink Elephant Balloon Striped Leggings to try out with Baby S. These are so cute, we just love them! Right now, they're too big for S to wear. She's on the small side, and the leggings start at size 3-12 mo. We're not quite there yet, but we will be soon. The design couldn't be better! S' nursery is a pink and grey elephant theme, so these match the theme of her other clothing and items in her room like a dream! The Doodle Pants Leggings are super soft, and so, so cute! S will look adorable in her Doodle Pants Leggings when she's tall enough to wear them. For now, I am having fun pairing them with different tops! They're designed to fit well over a disposable or cloth diaper, and give parents a stylish design. The sweet little elephant is a cute surprise on the behind, and will definitely have everyone who sees it talking. S will be big enough to wear these in late summer, as we heda toward fall. I am alredy dreaming up all of the cute outfits we can put together with these leggings. I'm not sure how big S will be when she starts to fill out, but if she's anything like my son was when he was a baby, I know I'll be glad for these roomy, comfy leggings! Doddle Pants Leggings are perfect for boys and girls, alike! We’ve seen far too many diaper-bottomed tots squeezed into skinny jeans. Doodle Pants also offers a collection of dresses, bodysuits, shirts, hooded towels and more! Doodle Pants are super cute, and will delight both you and your child! Headed to a birhday party or looking for a cute gift for a special little one in your life? Check out Doodle Pants! 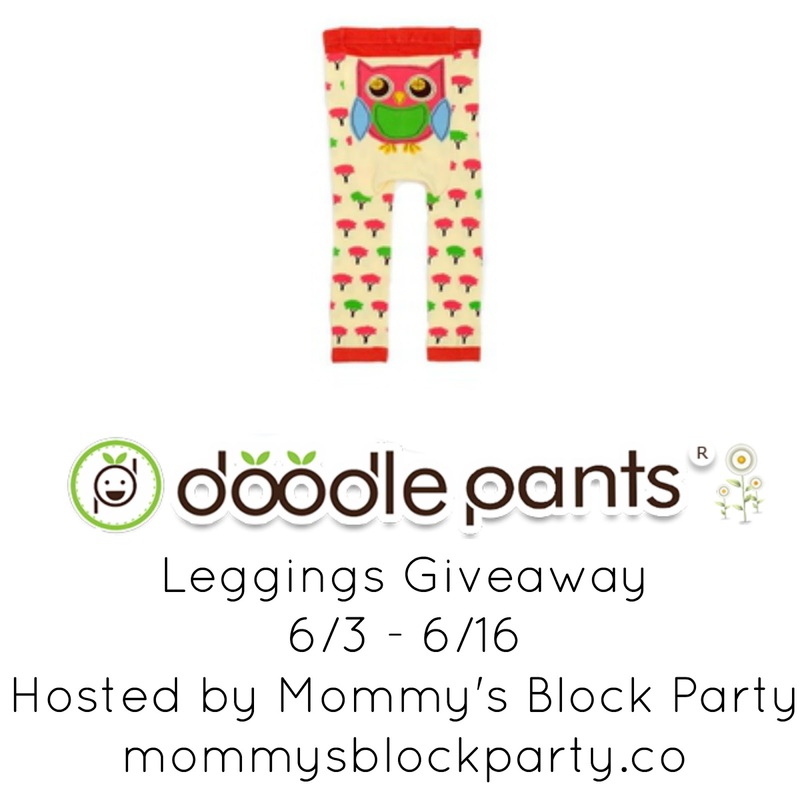 Head on over to Doodle Pants to browse all of their cute children's leggings and more! Connect with Doodle Pants through Facebook and Twitter. One lucky reader will win their own pair of Doddle Pants Leggings. Just use the entry form below to enter to win! We reserve the right to make revisions, to cancel, or suspend this contest for any reason. We are not associated with any of the companies named above. The odds of winning are based on the number of entries received Open to the US 18+ only. Confirmed Winner(s) (by Random.org) will be contacted by email. Winner(s) have 24 hours to respond before a new winner is chosen. No purchase necessary. Void where prohibited by law. The sponsor(s) will be responsible for product shipment to winner(s) of this giveaway. Mommy's Block Party (and any other blog participating) is not responsible for product shipment/delivery. This event is in no way administered, sponsored, or endorsed by, or associated with, Facebook and/or Twitter, Google, Pinterest. This disclosure is done in accordance with the Federal Trade Commission 10 CFR, Part 255 Guides Concerning the Use of Endorsements. Entrants must only enter with either one email address, IP address and/or Facebook account, anyone found violating these rules will be disqualified. It is at the sole discretion of the admin of the giveaway if the winner has met the rules or not. Special thanks to Doodle Pants for allowing us to share about their wonderful toys and games, and for offering this fun giveaway for our readers! These are so adorable !! Makes me almost wish I had a little one to dress. I would pick the Purple Cat Meow Leggings for my niece. I like the Blue Shark Jaws Leggings. I'd go with the Pink Horse Leggings. They are all so cute!! We find out Tuesday if we are having a boy or girl. For boys I love the camp deer and for girls I love the Navy flower leggings.